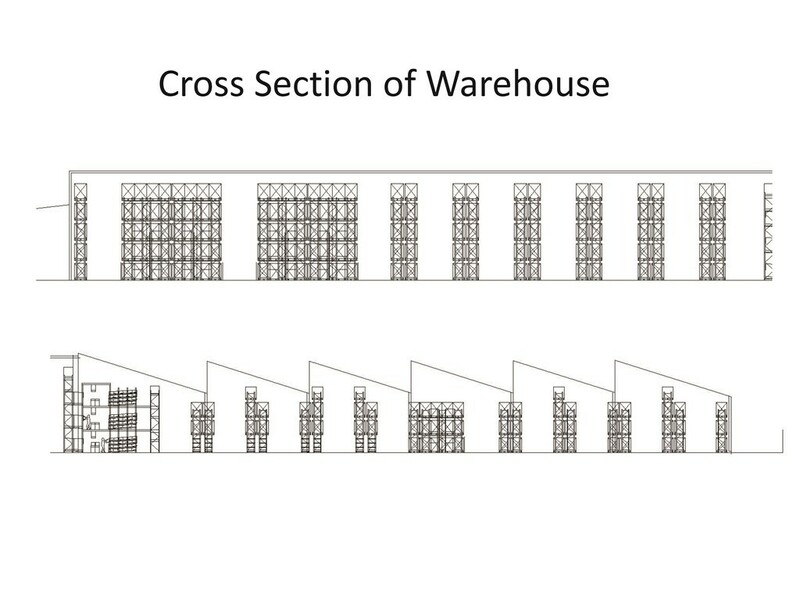 Can you Design a Warehouse? Try Your Hand at Identifying Constraints in Flow, Operation and Design. And then make your recommendations for the ideal warehouse design! In this interactive case study, you have a chance to compare your thoughts against the author’s? 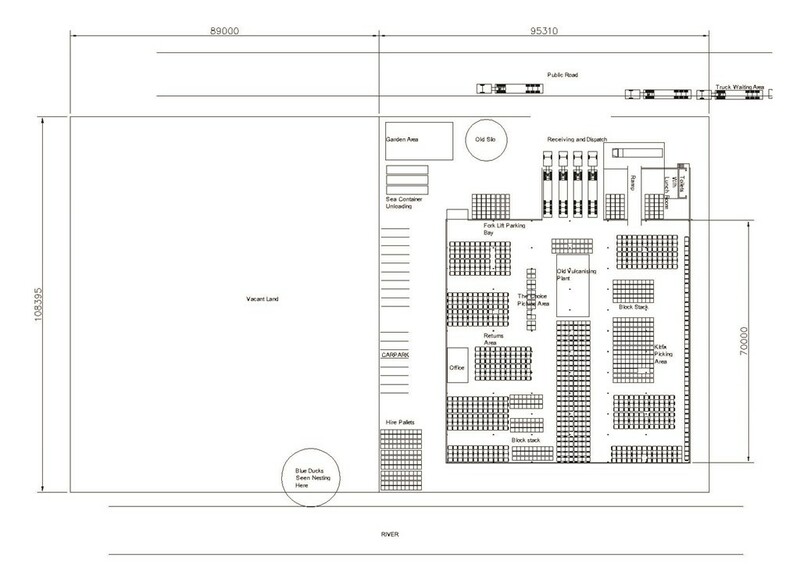 A description of The Choice’s operation is provided including data, issues encountered and layout drawings. The text includes hints on constraints, flow problems and design flaws. As you read, you will note key points identified by the writer in highlighted boxes. These comments will help you uncover salient matters that must be addressed if an effective warehousing design solution is to be developed. As you read, you may agree, or disagree with the comments, or have additional points to consider? If so, you are welcome to send them to author for consideration in the next issue of MHD. And if you are really keen, you are invited to make layout suggestions. So why not send your thoughts and/or preferred layout on a sketch for consideration. Be brave, all inputs will be considered for discussion in the next volume of MHD. The current distribution centre was an old tyre factory built in the 1950s which was been converted to a warehouse in the late 1990s. It’s a 5,000 sqm square building with a saw tooth roof design. The warehouse has 4 sunken docks, a ramp and a small awning for loading one vehicle space outside. There are remnants of a vulcanising machine in the warehouse, and the floor needs repair around it. So this prevents storage to no more than 2 pallets high in this zone. Point of View (POV): An old factory is unlikely to offer much flexibility as its purpose was manufacturing, not storage and distribution. The left over vulcaniser equipment impedes flow at receiving and dispatch and should be removed. Observations: Columns restrict flow; docks do not allow easy access from the road. Check: Column layout, load in and load out path for vehicles, truck turning circle. POV: There is not much under roof clearance, compared to many modern warehouses which can range from 9 to 11m clearance. It is worth investigating the development of the property next door, however, being near a river may introduce some design challenges. Observations: A nest of rare blue ducks resides on the vacant land. Check: Potential flooding, need for piling if building, environmental and wild life disturbances. POV: The need to shuffle stock around indicates poor layout, and picking practice. Picking cartons and eaches from pull pallets in a block stacked operation is less than ideal. Observations: Picking is performed with 2.5t diesel fork lifts. This is not recommended for anything other than full pallets, despite the purchase price. 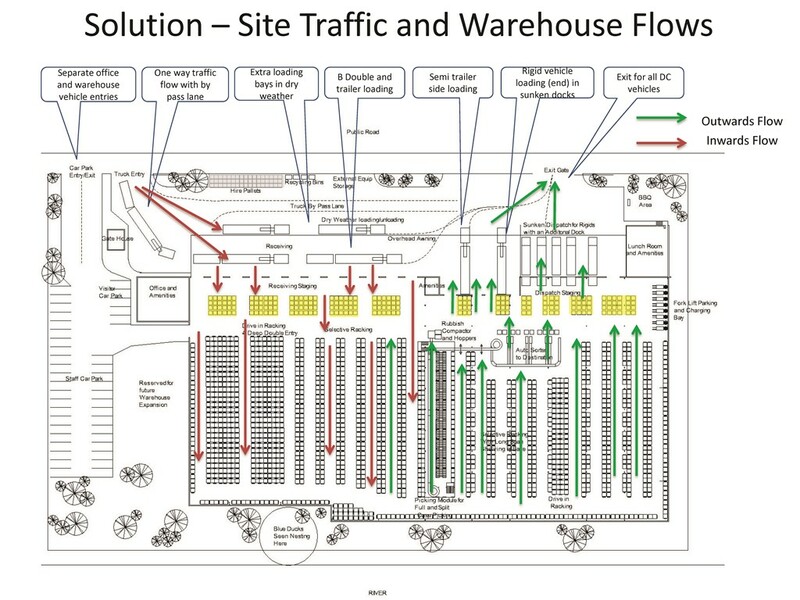 Check: Flows in the warehouse, receiving, picking and dispatch data, available storage space, ways of reducing congestion. POV: 2-3 days for receiving. Why so long? Should be no more than 24 hours. Car and truck movement around the property should be separated if possible. Get rid of the old silo which has no relevance to the current businesses. Observations: Sunken docks are excellent for end loading/unloading of containers and refrigerated vehicles, but are unusable for taut liners in this warehouse configuration. Check: What is holding up the receiving process, can docks be arranges another way? How many vehicles are received and dispatched each day? POV: It’s a good idea to outsource for overflows, but not when someone else’s priorities prevent service levels being achieved. Check: Other providers. Ways of holding stock at site e.g. 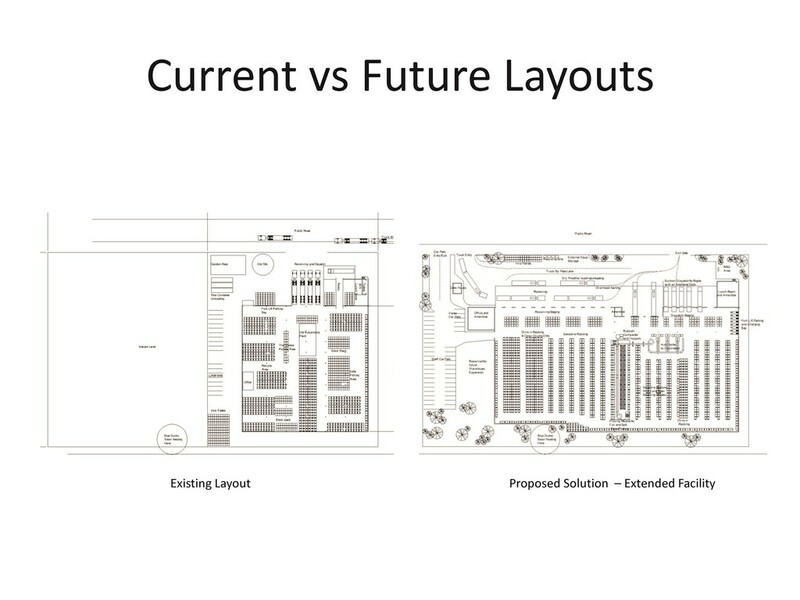 via building extension, change of layout. Better flow. POV: Bad layout and congestion causes over staffing. 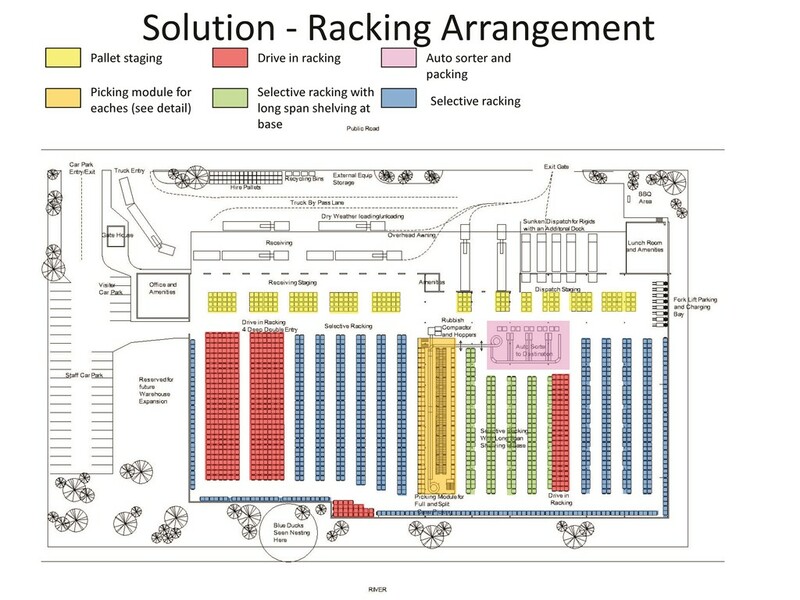 Observations: The racking layout features drive in racking and block stacking, with very little carton, inners and eaches order picking capability. Check: Building, layout, flow and racking types, picking methods. POV: A very common but high risk scenario. A key employee is the only person who knows where the stock is. Not recommended. As business expands, location address systems are imperative. Observations: Most modern WMS’s have location management capability. Check: Use of WMS stock management, potential to install slot numbering system, numbering all locations. POV: Drive in rack is not ideal for ‘use by date’ management as it operates on first in first out stock basis. Observations: With increased web sales the lines picked per order will be reducing. Also the items picked per line or SKU is in quantities of one and two. Picking from drive in or block stack positions for such quantities is not recommended. Check:Other modes of storage racking e.g. carton live storage or shelving, allocation of stock to each storage mode, quantities of stock stored per SKU. Observation: There is clear evidence of stock being stored in product families or groups, without reference to the frequency at which it moves in and out of the warehouse. 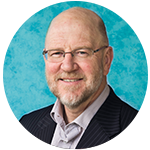 POV: As the company grows and expands its business it will need to dispense with the ‘fixed stock’ position and move to a system that places stock in storage locations according to usage. In simple terms, slow stock away from the docks, faster moving items closer to dispatch. Check: SKU Movement data, ability to place stock in the warehouse according to movement. POV: Space in this warehouse is at a premium. Picking non weather resistant stock and storing it externally is to be avoided. Check: Design of warehouse, use of awnings, order growth. The Dispatch manager is under pressure from the Transport Company due to delays loading delivery vehicles. The transport company manager has threatened to increase rates unless The Choicereduces from the current two hour loading time, to no more half an hour. POV: Scheduling of deliveries will help, but spatial capacity to load is limited. Check: Receipt and dispatch times, ability to schedule load and unload times, ability to load/unload vehicles within 30 minutes. POV: The Choice’s foray into sales over the web has been successful. But its picking, packing and dispatching capability is delinquent. Check: Costs, flow, layout, racking modes, obstacles to supply, bottle necks, staffing levels, KPIs. Your task is to advise the MD on what to do! To assist, he handed you some data which his operations staff prepared. Orders Per Day: 150 to stores and wholesale customers. 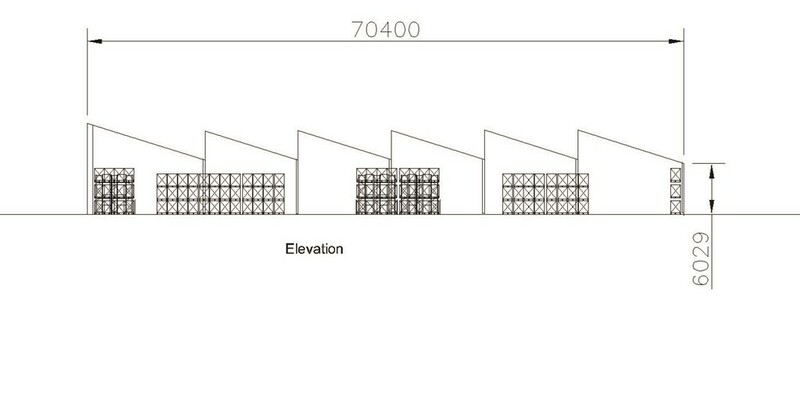 Range of pallets per order is 2 to 4.